100 Conversations Project - nurture. UPDATE/ April 19, 2018: This article originally posted in mid-March. Please read to learn more about what we’re up to with this project, then fill out this Google Form if you’d like us to reach out to you. Thank you! What is it like to give birth in our RVA community? Do you feel heard? Do you believe your voice is valued? At Nurture, we are curious to know what your experience with birth and early parenting has been. 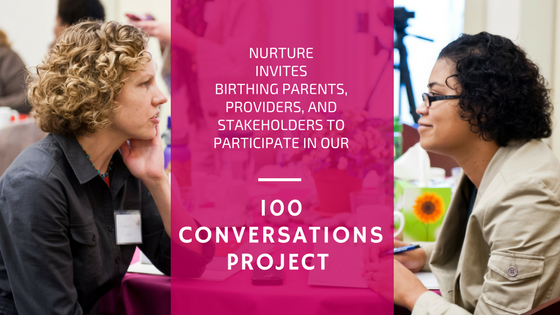 In adhering to our mission “to improve the health and wellbeing of Richmond’s childbearing families through fitness, education, social support, and community engagement,” Nurture is setting the intention to conduct at least 100 conversations with local birthing parents, and birth and early parenting stakeholders over the next 6 – 9 months. Inspired by models used in Initiatives of Change’s community trust-building program and in service businesses, these conversations will take place in both formal focus group settings, and informal one-on-one conversations. Part of our 2017 – 2020 strategic plan, created in partnership with Lindsey O-Pries at the Spark Mill, is to strengthen our internal operations to ensure our continuation as a nonprofit. In forming relationships with other perinatal organizations, we noticed that recurrent themes centered on diversity, inclusion, and equitable access to care and information. These themes form the backbone of our 100 Conversations Project. We are seeking to better understand the landscape of birth and early parenting in RVA, with an emphasis on how our city’s nested systems support (or fail to support) them, with deliberate regard to how socioeconomic status, gender identity, marital status, and race contribute as factors. While we will be talking with individuals, we understand the need to consider how different identities and contexts impacts experience. This will in turn enable us to serve birthing families more effectively. We also hope that that the relationships that emerge from these conversations will enable us to grow our board and committees so that our table represents the full spectrum of the 15,000 people who give birth in the Richmond region each year. It is their voices that are most important when we advocate for changes in prenatal care, birthing practices, and postpartum support. The 100 Conversations Project will happen in two phases. For the first, on March 31 we will conduct three focus groups of birthing parents who are pregnant or who have given birth in the last two years. Facilitated by Nurture board members and volunteers, they will take place at The Woodlot, the office location of our friends at the Spark Mill. Former Nurture board member Mary Cait Nannery, who is pursuing a doctorate in Health Policy at VCU, will conduct an analysis of themes emerging from these groups as a part of a Community Based Participatory Research class with Dr. Maghboobah Mosavel through VCU’s Department of Health Behavior and Policy. Because we are interested in how the demographics of a birthing parent can affect the quality of care and access to resources, our initial focus groups are taking the form of “affinity groups” led by facilitators who represent the membership of the group. The interviewer is an integral part of the conversations, and, since the prenatal and postpartum periods can be highly emotional, these dialogues can be nuanced and deserve to be met with both sensitivity and of empathy that comes from shared experience. As we compile data, our intention is to be authentic and adhere as closely as possible to each birthing parent’s experience. The second phase will start May 1 and continue through December 31st, moving from the innermost nucleus of birthing parent and child to the outer nested systems that support them, i.e. family members, care providers, policy makers, social justice advocates, etc. During this phase we hope to broaden our reach across demographic boundaries. Nurture envisions a world where all families are supported through the journey of pregnancy, birth, and early parenting. Where there is easy and affordable access to trusted support, educational services and community resources so that parents raise healthy, secure children in a strong and connected community. With this in both our minds and hearts, we invite you to be a part of our 100 Conversations Project. Birthing parents, partners, perinatal care and service providers, social justice advocates, and others who interested in supporting the health of RVA’s mothers, fathers, babies, and families are encouraged to participate. Click this link to sign up for one of our March 31 focus groups and/or future conversations.